Last Monday I reviewed a book by Pastor Brian Croft, The Pastor’s Soul, which is the third book in a trilogy of pastoral help books. You can read that review at the link above. However, it prompted me to go back and read the first in the series, The Pastor’s Family (published by Zondervan in 2013). I gave this book, along with The Pastor’s Soul four out of five stars on GoodReads. I must say that I enjoyed reading this book immensely. Co-authored with his wife Cara, Brian Croft was able to write what I would consider to be the most honest and helpful book to pastors and aspiring-pastors. I especially liked the format, in which Brian writes most of the book, but Cara will break in either to give the wife’s perspective of the subject, helpful advice to pastors’ wives, or even to clarify, it would seem at times, what her husband was saying. There are also a couple of pages at the end of each part where a person reflects on their own experiences. The first time is written by a pastor, the second by a pastor’s wife, and the third is by someone who grew up as a PK (pastor’s kid). Each of these “reflections” are helpful for solidifying what has been written in parts 1, 2, and 3. In the first part, Brian seeks to help pastors understand their role in the family. It is his desire to see us as pastors living up to what true success is–not some secular version of the term, but God’s version revealed in Scripture. He gives us both the problem (chapter 1) and the solution (chapter 2). He pointedly asks the rhetorical question, “What if God evaluated the faithfulness and greatness of a pastor, not simply by the successes of his local church ministry, but by how well he cared for and pastored his own family–his wife and children?” (p. 23) And then he shockingly, but truthfully admits that “The only person lonelier than a pastor in a church may be the pastor’s wife.” (p. 41) This was not to make church members feel guilty, but to open the eyes of pastors who can become inwardly focused toward their own loneliness and miss that their wives are just as lonely, if not more so. Tolle Lege if you want to know how he resolves this. The second part is about caring for the wife. This time, it is Brian doing the breaking in to explain things from the husband’s perspective–at least the first chapter of the section. Cara gives an honest look at what it means to be a pastor’s wife and how this affects the family and the church. 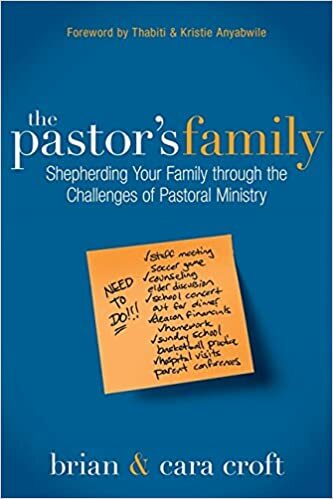 She wisely advises, “[I]t’s important that the wife of a pastor shares his desire to serve the church, but her service cannot be motivated by a concern for what other people think.” (p. 69). But she also rebukes the wife who often will keep things to herself, becoming overwhelmed. “If we do not make our needs known to others, we cannot expect them to help us.” (p. 76). The next chapter is Brian showing the pastor ways to care for his wife. The third part deals with caring for the kids. I don’t want to give too much away from this part. This was probably the most convicting portion of the book personally. I have often sought to care for my wife, but feel like I am not as diligent with the kids. After reading this book, I feel doubly so. Pastor Croft gives good, but difficult advice on how to pastor and father one’s children as individuals and as a group. He does advocate for family worship/devotions, but goes beyond just that. He also gives tips on how to get your children ready for Sunday’s sermon, which I found interesting. Throughout this book, we are given examples of good ministers, but bad family men. Yet, he also gives us examples of men who were able to do well at being both. It was hard to hear of men, respected by almost all in the faith as being great pastors and evangelists, being neglectful husbands or fathers. But as pastors and Christians we are to be about the truth and learn from those who went before us, emulating their faith, but not their failures. No, we learn from their failures. In fact, Cara is open about one other item from which we can all: her battle with depression. Though it is a quick chapter in this book, she explains the first time she went through it as well as the second time, and how she was able to get help. At the time of her writing this book, she admits to being in another bout. Pastors and wives would be greatly helped by this chapter alone. I would absolutely recommend this book to anyone, at only 166 pages beginning to end, it is not a difficult read. It is not a theological book, but a practical book. I would recommend it especially to pastors or wives who are struggling in their marriage, pastors whose children seem to be more and more resentful of the church, and aspiring pastors (those who are feeling the calling or are currently in seminary). I would also recommend this book to laypeople in the church. It gives a clear and concise picture of what it is like to be a pastor or pastor’s family. If you’ve ever wondered what it would be like, read this book. The Crofts deal honestly and openly about the good, the bad, and the ugly. I am looking forward to now reading the second book in the trilogy: The Pastor’s Ministry. I hope to be writing another book review soon.